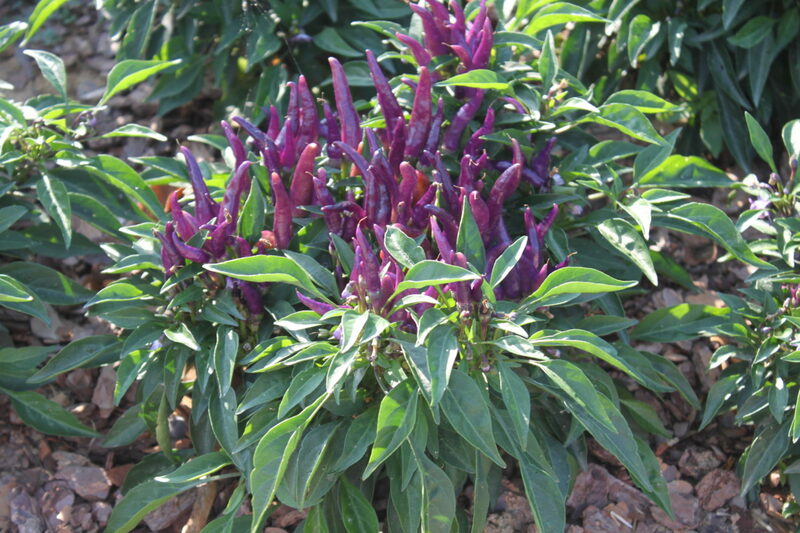 Ornamental peppers have become a big part of our garden and our landscape at the farm. Yes, our garden plan still calls for a large planting of the old regulars – like the green and red bell, jalapeno, banana and chili peppers we love to eat, cook and can with. However, as each year passes, we find ourselves using more and more new varieties of pepper plants in our landscape as well – and not just for the great taste – but for some great looking flowerbeds! Whether it’s a mass planting of ornamental Poinsettia peppers at the upper pergola, a few tri-colored mini belles planted among a stand of ornamental grasses, or a hanging planter loaded with poinsettia peppers – it doesn’t take long for visitors to the farm to notice the unique plants. That is almost always followed by the question : “What kind of flowers are those?” Most are astonished to find out they are pepper plants – and even more amazed to find out almost all of them are delicious to eat! 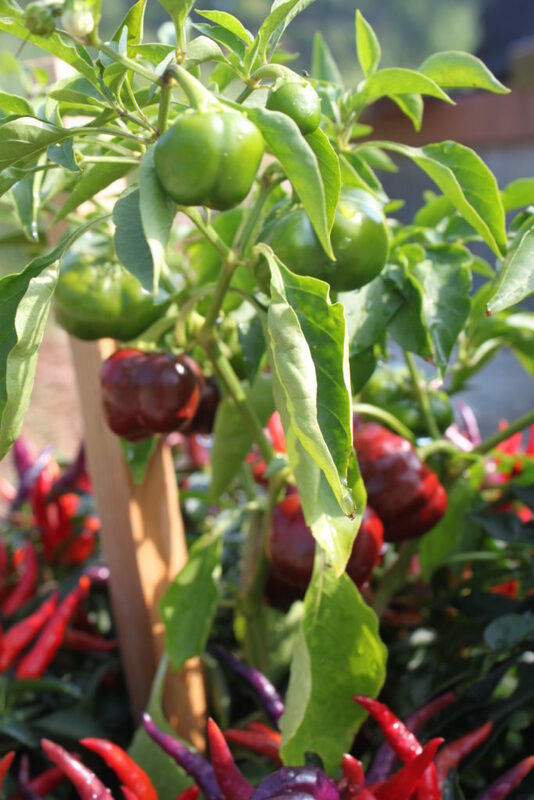 Ornamental and specialty peppers really are the ultimate dual-use plant. They provide beautiful color, texture and variety to your flower and landscape beds…and can do the same for your taste buds! Most ornamental and specialty peppers are edible – but some definitely have more taste than others. Some, like the Orange Tequila and Cajun Belle, are great to add color and taste to salads, salsas and soups – and can be used to make some incredible appetizers! 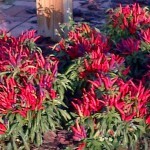 As ornamental and specialty peppers continue to grow in demand each year – the varieties seem to expand along with them. You can find them in almost any size and color – from purple, red, green, yellow and orange to all shades in between. A couple of notes of caution though. they can be really hard to find in greenhouses in the spring – and if you are lucky enough to find them – they can be costly. For that reason alone – we grow the majority of our ornamental peppers from our own seeds that we save from year to year. We will usually order a few seed packs each year to try something new. If we do happen to be out and see a new variety at a greenhouse – we’ll plant it once and save the seeds in the fall to grow ourselves next year. So, as we get the soil pots ready to start growing our peppers here in a few weeks, think about adding some great new varieties of peppers to your plan. And better yer – instead of thinking they belong only in the garden – place them in small groupings in your flowerbeds or in a mass planting to add a splash of vibrant color to your landscape! Sangria is my all time favorite! It’s incredibly versatile plant in the landscape. We use them in mass plantings, pots and hanging baskets, all with great success. They are strong growing and tolerant plant – and can get by with much less watering than other annuals. The best part- it’s really three plants in one. 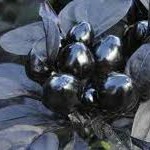 You get beautiful dark green foliage in the early spring…followed by hundreds of slim dark purple peppers by early to mid – summer. As the fall come on strong – they turn to a brilliant red and orange for incredible new color to the landscape. The seeds are easy to save for the next years planting as well. 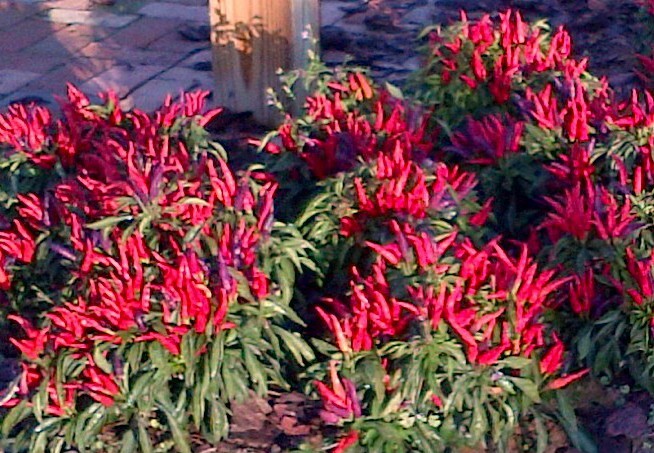 Poinsettia peppers are another favorite of ours. These are a little taller and bushier plant than the sangria – growing to about 16 to 24″ tall – with the pepper pods coming on in late June. Each plant is covered in hundreds of the pepper pods. They start out as an ordinary slim green pepper – and then turn to an incredible fiery deep red from early August until well after the first frost. 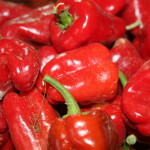 They are a tasty little pepper that can be added to stir fry to give off some deep heat – or you can put them in olive oil to have hot pepper oil. 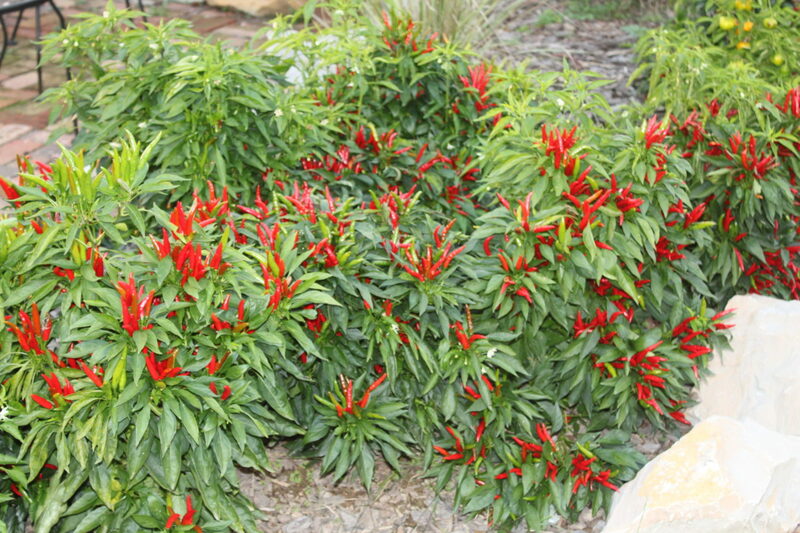 Poinsettia peppers are another easy seed to save and require little maintenance. These plants will grow to be about 18″ to 24″ high and are covered in 30 to 40 1″ to 2″ mini bell peppers at a time. They have a super small seed core that is easy to remove, and are perfect for salads and salsas. This is also one of our favorite peppers to use for making great appetizers. We use a good spicy sausage and cream cheese stuffing that makes for an incredible paring with the sweet taste of the peppers. They look great in the landscape too as an accent plant – adding a splash of color wherever you put them. Cajun Belle Pepper. 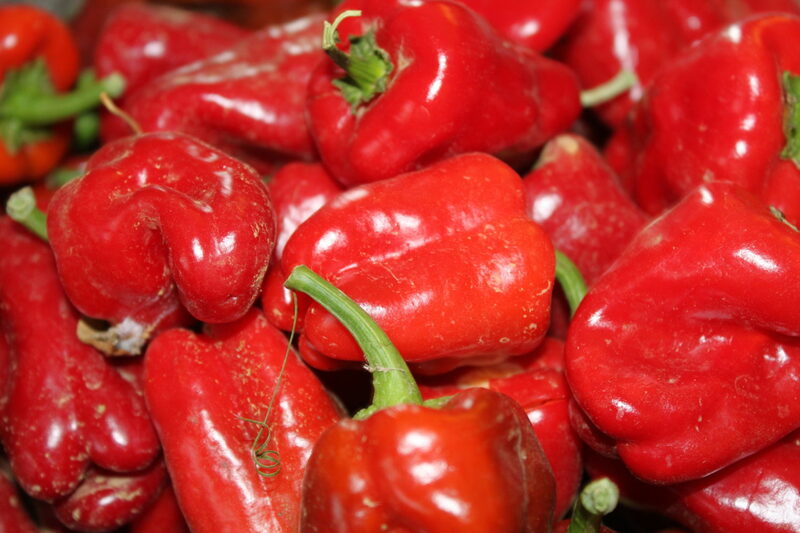 An abundant producing pepper that can best be described as sweet heat. The Cajun Belle is the ultimate pepper to have if you love the combination of sweet with heat. They average about 2″ in size, and have a seed core that is easy to remove. They make an incredible stuffed appetizer, are great to chop up in salads and salsa or chili, or to use on a sandwich. An added benefit of the Cajun Belle – they freeze really well and are great to pull out for use during those cold winter months. 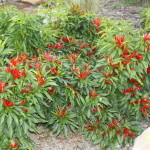 The plants are absolutely beautiful in the garden or landscape – filling up with 50 or more brightly colored peppers ranging from green to orange to bright red when fully ripe. 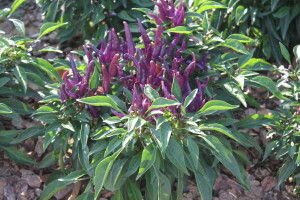 These peppers are not only dark purple and black in color – but the dark foliage really can give accent to your flowerbeds. They grow to be about 14 to 20 inches high and about 15″ wide. 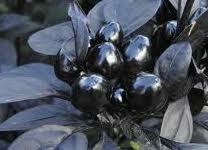 The plant produces tons of 3/4-inch fruit that is round with a sharp point near the bottom. The peppers start our black in mid summer, and then turn to a beautiful shade of dark, deep red in the fall. It is very tolerant as well, like almost all peppers, and most insects do not want any part of the hot and spicy peppers. They are certainly edible – but very, very hot! If you would like to receive our weekly DIY and Gardening Posts – be sure to sign up to follow our blog via email, Twitter or Facebook in the right hand column of the blog. ← The Launching Of Old World Garden Vintage – How Pergolas, Farm Tables and Canning Cabinets Will Help To Build A Dream!